Wear orange Thursday, September 5! Join us at the University of Bridgeport, Monday, September 30, for a free, special showing of A Place at the Table, a thoughtful documentary which takes a look at hunger in America. After the screening, stay for an important panel discussion with our President & CEO Nancy Carrington and others. Now that schools and colleges are back in session, we need daytime volunteers to help sort and bag fresh produce at our East Haven warehouse. Does your school offer federally funded breakfast? 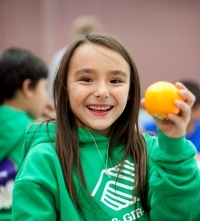 The National School Breakfast Program supports child development, improves health, and boosts student achievement and student behavior. So why is Connecticut last in the nation for schools who participate in the National School Lunch Program? Click here to see if your schools participate.